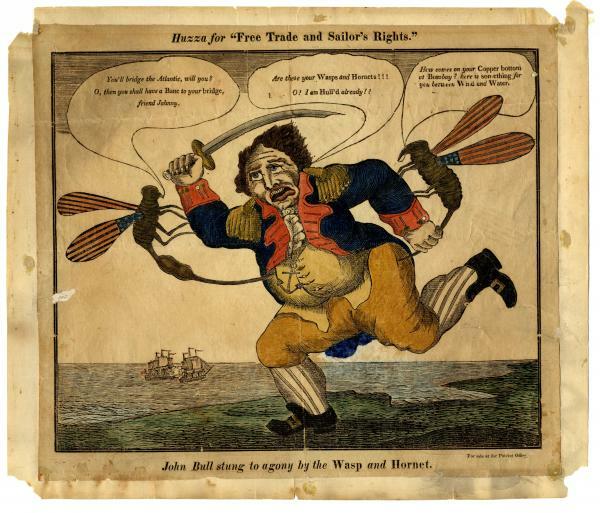 In this cartoon two large insects, a wasp and a hornet are stinging England in the caricature of John Bull. The Wasp and the Hornet were also the names of American warships that administered stunning defeats to the British navy early in the war. The Wasp defeated three British ships: The HMS Three Brothers, Baachus, and Atlanta on September 12, and 26, 1812, and the Hornet who sunk the British ship Peacock on February 24, 1813. The first balloon depicting the words of the Wasp says, "You'll bridge the Atlantic, will you? O, then you shall have a Bane to your bridge, friend Johnny." This is a play on the name William Bainbridge, who was a U.S. naval commander. John Bull is saying in the middle balloon "Are those your Wasps and Hornets!!! O! I am Hull'd already." Again, this is a play on words referring to Captain Isaac Hull, commander of the U.S.S. Constitution. The final balloon says, "How come on your Copper bottom of Bombay? Here is something for you between Wind and Water." This refers to an incident when the HMS Java was set on fire and sunk by the American Navy on January 1, 1813. The Java was carrying a cargo of copper to outfit British warships being built at the shipyard in Bombay, India. This also might refer to the copper-bottomed hull of the U.S. Constitution. It was said that this protected the ships from British cannons and gave the vessel her nickname of "Old Ironsides." At the top is the cry "Huzza for Free Trade and Sailor's Rights" which refers to the American grievances that propelled the country into war. Both British and French ships harassed American shipping, disrupting cargoes and in the case of the British taking American sailors off and impressing them to serve in the Royal Navy. Exact Title: Huzza for "Free Trade and Sailor's Rights" : John Bull stung to agony by the Wasp and Hornet. Place of Publication: Boston, Massachusetts? Dimensions: 22.4 x 27.0 cm.